OK, I admit it. I have been putting off writing about climbing. Not because of the latest compliment/putdown by Andrew B. And it's not because I have been trying desperately to get in just one more decent session on European Human Being before the snow entombs it until next July, though that has been an issue. It could be apathy, could be laziness, it could be burnout. Whatever, as people used to say before whatever became, well, whatever. Then the World Cup rolled into town last week and I began thinking a bit more about what this implies for climbing moving forward. Or to be more precise, what Ramon Julian Puigblanque's onsight of the Crew at Rifle, a few days after the event, implies. Comp-wise, Puigblanque placed 8th in the World Cup, primarily stymied, as was the similarly height-challenged Sean McColl, by a peculiarly long dyno move relatively low on the final route. The event by the way was a blast to watch at home via a web feed that worked very well. Well done Jon Glassberg and the IFSC. Though the men's final looked as though a compass and GPS would have been handy for finding your away around, the comp went very well in my view, and the push for inclusion as an Olympic sport seems justified. But back to the Crew. This ascent was rapidly spread about the Internet and with considerable justification. But there has not been much comment in US media on what it implies about the state of European climbing. First, the Crew has long been a rite of passage for Rifle climbers since its establishment by Chris Knuth, the hardest route there for ages, worked over weeks if not seasons for many. Furthermore it is a top route in a place that prides itself on hard grading. And furthermore again, it was the first onsight of the grade for Puigblanque. The ascent was made without kneepads or esoteric kneebar beta, both considered mandatory for the Crew. The question has to be asked. Is there any climber from America remotely capable of such a feat anywhere else in the world? And that is setting aside the myriad other hard routes Puigblanque onsighted in Rifle, including Living in Fear earlier in the day. I am going to go ahead and say no. I am not going to pontificate on whether that's a good or bad thing. After all climbing is a lifestyle, not a sport, or something, which is what people would say when they left comments on this kind of thing before. But regardless, it is an ascent that should certainly leave American pro climbers wondering what's next. Olympics indeed. Sharma has come close to onsighting 8c+ in the past but unlike Puigblanque he doesn't train specifically for it. So, for the time being, competition climbers seem to be the best onsighters, and there is currently no US climber in the top 10 of the World Cup circuit, or is there? Chris Sharma is not really an American climber, given his long-term residency in Spain. He is also unrepresentative in that he is not an Olympic-style athlete, which Puigblanque is a great example of. My feeling is that as climbing becomes more like an Olympic sport in the comp arena, the lifestyle/raw talent climbers are going to be left behind not just at comps but in the field as well, at least in sport climbing. The exception might be in trad/expedition style climbing. Serious training makes that kind of a difference. Regarding US climbers in the top ten, no American climbers, male or female, participate consistently enough to really say, but as far as I can tell, there are no top-10 ranked competitors from the US. I am very impressed by some recent US female ascents. Jen Vennon on Stockboy's Revenge at Rifle, Sasha DiGiulian's recent climbs, Angie Payne in bouldering, and so on. These are on an international level or close to it. The only US male sport climber I have seen recently who has really shown he can get the job done, again and again at virtually every crag in the US, is Jonathan Siegrist. No one else is even close at this point. But he doesn't want to compete. Talking with him recently, I sensed he would like to go to Europe but also that the sheer number of hard climbs there to be done was a bit overwhelming. "My feeling is that as climbing becomes more like an Olympic sport in the comp arena, the lifestyle/raw talent climbers are going to be left behind not just at comps but in the field as well, at least in sport climbing"
"How are you training when you are not climbing? I train more or less only by climbing. I go spinning once a week. I also train mentally while lying on my bed and looking at the climbing wall in my room. :-)"
Contradiction? Seems like Ondra is in many ways a latter day Chris Sharma, much more a "lifestyle" climber. How does this square with your argument? My belief is that the athletic aspects of the sport will overtake the others for most professional climbing pursuits and that even the likes of Ondra will have to step up their game. 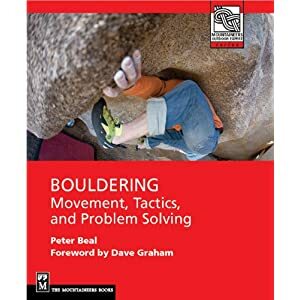 As far as the US is concerned, I have trouble thinking of any boulderer or sport climber who trains as seriously as a regional-level gymnast might do, indicating to me primarily the immaturity of the sport. For a real athlete, look at Ueli Steck's regimen and achievements. Obviously time will tell.